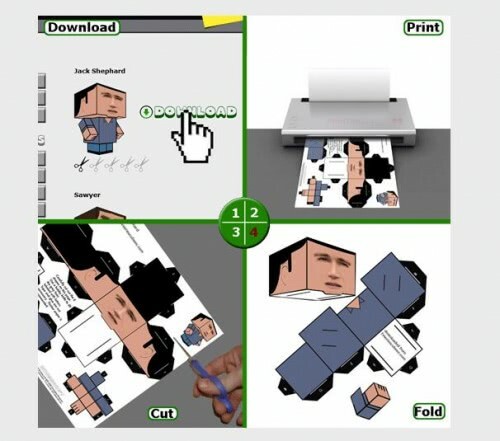 TV Series Papercraft can be seen as an addition to the Cubeecraft Papercraft series. Papercrafts are little toys that come on paper. They have to be printed, cut out and assembled which is where most of the fun lies. Cubeecraft had some wonderful designs like Iron Man, Stromtroopers, Indiana Jones and as their latest edition the Vault Boy from Fallout. TV Series Papercraft concentrates on popular tv series like 24, Lost or Prison Break and delivers some interesting looking designs of popular characters of those series. If you look at the 24 category you find papercrafts for Jack Bauer, Tony Almeida, David Palmer and Mike Novik among others. Each tv series contains several character designs which can all be downloaded and printed without additional costs. The site has a interesting vintage tv series category with stars from the past including Magnum, CJ from Baywatch, Michael Knight from Knight Rider and B.A. Baracus from the A-Team. The process is always the same. The visitor picks a design he wants, clicks on the download button next to it which will display the design as a jpg image on the screen. That image has to be printed. Once it is printed the user has to cut it according to its plans and assemble it so that it resembles the tv star. A great addition to the Cubeecraft collection. Update: The designers are putting out new designs like crazy. You now find fan art on the site in addition to original designs. What this means is that you get access to more than 300 additional designs that you can print out and create characters from. The fan designs include illustrious characters such as R2-D2, C-3PO and Obi Wan Kenobi from Star Wars, Nintendo's Mario, Krang, Schredder and April O'Neil from the Teenage Mutant Ninja Turtles series as well as all the turtles and hundreds of additional character designs. All designs are free to download and print. The site displays a difficulty rating next to each design now which gives you information about the complexity of it.